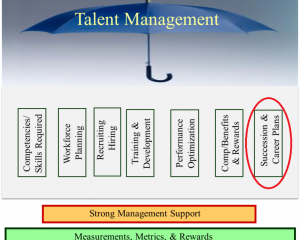 Succession and Career Planning is the last component of a successful Talent Management system. In the previous Talent Management Blogs, we defined “ Talent Management ” as a set of integrated organizational HR processes designed to attract, develop, motivate, and retain productive, engaged employees. Hypothetically, we have created the job requirements, determined that we need someone to fill a role, recruited and hired a great new employee, provided the training required to be successful, set standards and expectations, provided the feedback such that they can continue to improve their performance and determined how said employee should be compensated and rewarded. Wow, that’s a lot of cost (typically between $7-10K for professional workers) and work for the HR team, the employee and the employee’s manager. Now, we need to make sure the employee has a long-term successful path in our company AND we have a plan to fill their position when they are moved into another assignment or it they leave. Definition: Succession Planning is a process for identifying and developing new leaders/experts who can replace current leaders/experts when they leave, retire or move onto another assignment. Both Succession Planning and Career Planning are needed within a company as they serve different purposes. Simply stated; Succession planning is organization/company focused and Career planning is individual focused. Remember, both of these elements are significant contributors to a positive culture and a successful organization. There are multiple cloud based systems that Group50 supports and recommends. These allow an organization leader to create a workforce plan, enter their team’s information and build a plan to ensure a smooth transition when change occurs. These systems range from standalone Succession Planning software to sub-systems integrated into HRIS/HCM systems. Group50 can assist in the selection, vendor selection and implementation of these systems. For smaller organizations, a simple Excel data base process is sufficient. Group50 has several templates that an organization can utilize. These contain a series of data points (name, position, time in role, 1-2 potential candidates, expected timing for the change, skills/experienced required prior to or part of the transition, etc.) that is updated at least quarterly and ties in with your Performance Optimization work. The most IMPORTANT FACTOR is that these manual plans are updated and discussed regularly. This is where the individual takes the ownership to consider future growth, promotions, relocation, etc. and then to work with their manager to integrate training, development, mentoring, etc. to be able to deliver on their path. Again, there are cloud based systems and simple manual templates such as Learning Maps that can deliver a successful program. The most important factors in this case are: The openness and honesty of the manager, an honest assessment by the individual and a willingness of the organization to invest in Career Planning. Again, Group50 can assist in the selection and startup of these systems. As you can see, Talent Management contains several highly integrated sections that will enable you to take a strategic approach to managing your Talent. Each portion can be complex and often requires a specialized set of skills to manage to ensure your organization delivers your business requirements. If your company does not have the in-house expertise, search out and hire a subject matter expert to guide you through this important section of your overall Corporate Strategy. 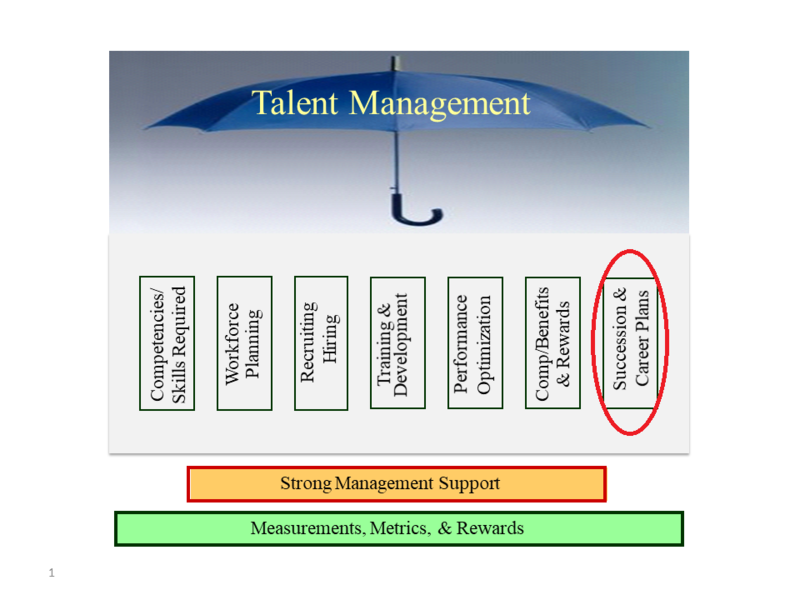 The full series on Talent Management (8 Blogs) is available on the Group50 website. About the author: Bruce Dougan is the head of Group50’s Organization Design and Development Practice and a Talent Management subject matter expert. Bruce and the Group50 team are all former executives with well-known manufacturing and distribution companies who understand what it takes to design, train, develop and motivate organizations to successfully implement a company’s strategic plan. Group50 has designed a series of strategic assessments, workshops and strategic execution tools that optimize your organization. You can reach Bruce at (513) 508-0351, request more information here, or send a note to info@group50.com.